Honda EU2200i Review: Really much better than EU2000i? Is the Honda EU2200i easy to operate? How is Its Power Output? Does it come with a good warranty? EU2200i, EU2200i Camo, EU2200i Companion: What is the difference? Where to buy the Honda EU2200i? Now, can Honda satisfy its vast client base with EU2000i? Can they hold on to a single product for that long? Can they stop making legendary generators? No. They had to move on. So, at the early spring 2018 Honda made available its new legend, The EU2200i, nationwide. EU2200i is perfect than ever. 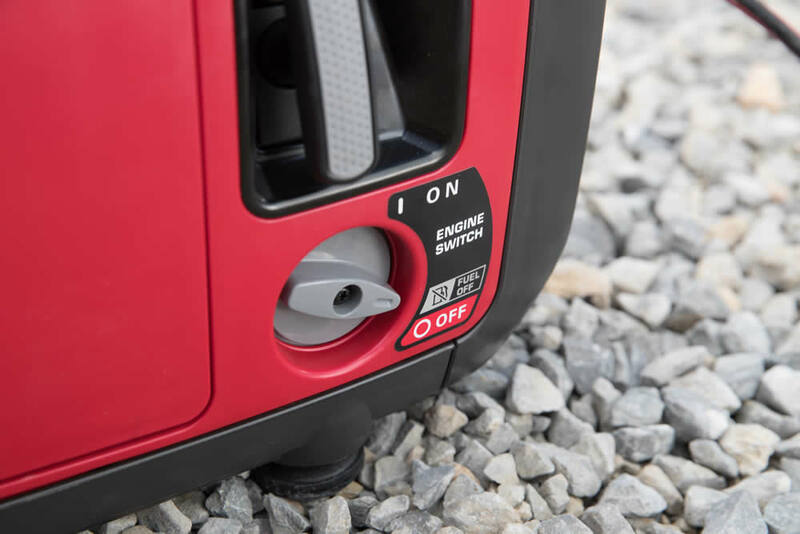 Whether you need one for camping, excursions or simply as an additional backup in your garage, then this is definitely the portable generator we prefer. Honda has been prominent for its portable inverter generator lineup for a long time. The journey began 20 years ago when Honda pioneered the use of inverter in portable coverings. Nonetheless, Honda’s inverter technology was so persistent that it could generate power closer to the “line power”. That was impossible for any other non-inverter generator at that time. Alongside this persistency they made the generator portable, easy-to-use and light weight, no one could resist something like that. As the days passed by Honda kept improving its designs, models, performances and eventually they reached to the Honda EU2000i. This product has earned its right to be a legend. It had more power than ever, more durability, top notch performances and noise like a walking cat. That was a sneaky beast with prominent performance. It’s been in the market for a long time and Honda was ruling over the generator industries with it. Now, can Honda satisfy its vast client base with EU2000i? Can they hold on to a single product for that long? Can they stop making legendary generators? No. They had to move on. So, at the early spring 2018 Honda made available its new legend, The EU2200i, nationwide. EU2200i is perfect than ever. It generates 10% more power than EU2000i. It has tons of new features that made Eu2200i standout among other portable generators both inside and outside Honda. It comprises color coded components, stress-free oil fill/drain, smart fuel shut off valve, concentrated output on low RPM and many other features that made it easier to carry, use and maintain. The first series was the EU1000i by which Honda revolutionized portable inverter generator. It had goodwill of being silent and after 20 years Honda still continues that goodwill and EU2200i is the most noiseless version of it. If light weight, powerful and quite is the definition of portable generator then EU2200i is the only Inverter generator that defines its kind. 10% more power: Honda EU2200i is now more powerful than Honda’s previous version EU2000i. This allows the users to use more equipment. 2200 Watts simultaneous power supply helps powering a wide variety of electronic devices that were not possible before. No matter which device you have you can power it with EU2200i. Honda GXR120 Engine: This engine was industrialized for heavy duty construction uses and now it is used in EU2200i. This gives the generator extreme durability and reliability. The GXR120 is top of its class and can produce simultaneous power supply ensuring prefect power for EU2200i. Easy starting: EU2200i is engineered nicely so that you get a quick and smooth starting every time. It has automatic mechanical de-compressor that ensures reduced force to start the machine. Less noise: Noise is a strong issue when you are using a portable generator. Honda made this generator keeping that in mind. EU2200i is so quite that it produces sound like a normal conversation allowing you a noise free power support for your home, RV or camp. Light weight: The term portable generator indicates light weight product and EU2200i in not an exception. It is only 47 pound and its size is so compact that you can move it anytime and anywhere. Fuel Efficiency: This one has exclusive Eco Thorttle System that ensures supreme fuel efficiency. It can run for maximum 8.1 hours on less than 1 gallon of fuel. Parallel Support: If you need more power than you can use EU2200i with a parallel connection to same or other model like EU2000i. This will give you more power with consistency. Fuel Shut Off: If you switch this, your generator will automatically shut off when it sense low fuel in it. It prevents fuel issues along with other mechanical issues in the generator parts and gear. This will keep your generator safe for a long time. Electronic Circuit Breaker: EU2200i has a tremendous circuit breaker that saves the generator and the machines running on it in case of power overload. Advanced Inverter Technology: This generator has a tremendous inverter technology that is excellent for sensitive equipment like laptop, mobile, etc. Warranty: Honda EU2200i is covered by three years of residential and commercial warranty. To avail this, all you have to do is buy this from an authorized dealer or from Amazon. Is it? Let’s find out. It has a tremendous automatic mechanical de-compressor which allows you to start the machine using little or no force. It has made the operation easier. Honda EU2200i has its legendary noise reduction capability which enables it to operate at low or no noise. To be specific you will get a maximum of 57 dB(A) when running at full power. That means you can put it anywhere and forget about it. Another great opportunity with this generator is its weight, less than 47lbs. That means moving from place to place has never been easier. How about dimension? 20.0″ x 11.4″ x 16.7″ seems pretty small for this beast yet another quality to think of. 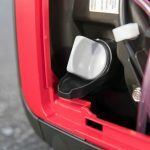 Easier fill/drain with shut off valve has added more flexibility than ever. 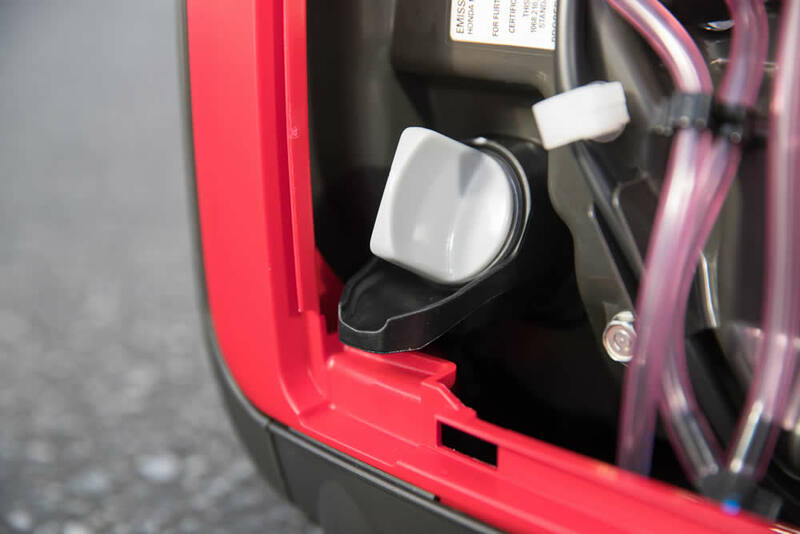 It also has a smart oil indication feature that shuts of the machine automatically when it senses low fuel. So you don’t need wait or keep an eye on the oil any more. It has a fuel capacity of .95 gal which again features low weight and it has 10% added runtime than the previous EU2000i. The Honda EU2200i generator is powered by the Honda GXR120 Commercial Series engine which is well admired for its fuel-efficient performance. Last but not least, Starting EU2200i is easier than ever because of its cutting edge technology. So, we can say that Honda EU2200i easy to operate. When it is a concern of power, the engine comes first. The EU2200i uses Honda’s one of the best engine GXR120. It’s a commercial engine and capable of producing smooth, noiseless and fuel efficient performance. The size of the engine is rather small compared to other engines yet at 121cc, the GXR120 is unbeatable. It always ensures extreme power support for the EU2200i. The best news for the user is that GXR120 was originally industrialized for heavy duty construction equipment so the reliability and durability is beyond question here. Now what is the output of this beautiful engine? Well, you will get AC output of 120V 2200W max. (18.3A), 1800W rated (15A) and DC output of 12V, 100W (8.3A). This enables you to run wide variety of electronics items. Some of them are Blender, Microwave Oven, TV / DVD, Computer, Hair Dryer, Incandescent Lights, Mini Fridge, Refrigerator or Freezer (Energy Star) and many more. Another great feature of EU2200i that will ensure supreme power output is its parallel connection. It allows pairing of the all-new Honda EU2200i with a Honda EU2000i K1/T1 model or another EU2200i for added convenience and more power. This will ensure superior experience and strong power support to solve your purpose. 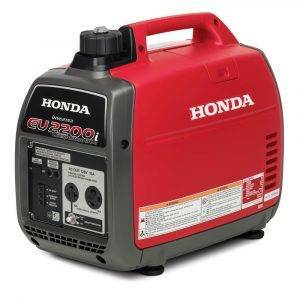 Honda EU2200i is one of the best in Honda super quite portable generators. This is an inverter equipped model that comprises momentous engineering and enclosed body which results noiseless performances. Honda, like always, ensured easy maintenance procedure so that end-user finds it comfortable to maintain this amazing generator. There are numerous tremendous engineering and designing included in this generator and they are solely focused on easy maintenance. Every user can maintain their generator without any prior knowledge. It’s that simple. EU2200i includes a larger oil filler opening along with a longer spout. This will assist you refueling faster and cleaner. Bigger oil drain gutter is also available in this model so oil change is happening in a blink of any eye. This also removes any dirt and other contamination easily. It also has a fuel shutoff valve. This ensures shutting of the engine when it is low on fuel. For this you will have to keep the switch to “fuel off” position. This ensures good condition of machine parts and gears. It does it automatically so fewer things to worry about while maintaining the generator. Increased product durability and reduced potential damage to the generator body is ensured by stamped metal recoil rope. No need to worry about generator body. Also there is a color-coded operational contact points to walk you through the starting mechanism. This generator can be easily paired with different generators to ensure robust performances. This function is built-in so there is no chance for error or any damage. The function is user friendly and smooth. You won’t need any prior knowledge to do this only a few pre-guided tasks and you are good to go. You can pair EU2200i with the same model or other model like Honda EU2000i K1/T1, Honda EU2000i. Ventilation is an important part of any machine and this portable generator got it figured. It has an increased ventilation area of 2.31 square inch which is more than enough. This insures greater inverter cooling. There are some additional new ducts which allow promising internal air flow. It keeps the key components cool and thus ensures durable machine. This will also improve overall performance of the generator. No need to worry about. In short the EU2200i got everything figured. You don’t have to do much to maintain this generator. Everything is pre-defined, automated and taken care off. This is a smart generator and is easy to maintain. Have a look at the owner’s manual here to see for yourself. Good warranty? The all new Honda EU2200i came with best warranty. Unlike other portable generator, Honda EU2200i is offering three years of warranty for both residential and commercial use. This simplifies the confidence and the capabilities of this generator as they are giving such a long term warranty. Make sure you are buying this portable generator from Honda’s authorized dealer to avail this warranty. It’s always good to know that you are covered from top to bottom for up-to three years. This is the best you can get in this line of product. 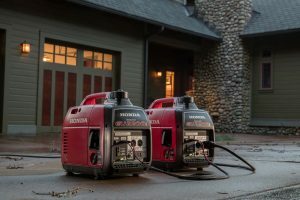 According to Honda, as they are confident on their new creation, you won’t need any warranty because you can run this generator smoothly way more than three years. That’s for sure. Well, it’s a burning question. But, before judging the price its worth taking a look at what you are getting. Firstly, you got a reliable name “Honda”. You have a superior engine GXR120 inside a beautiful generator dimension of 20.0″ x 11.4″ x 16.7″. Less than 47 LBS and comprises less sound. And it has three years warranty. So, is it expensive? Not at all. Honda’s recommended retail price is only $1149.95 which is less than EU2000i. There is a chance that you might get some discounts from several dealers. So, Good luck. 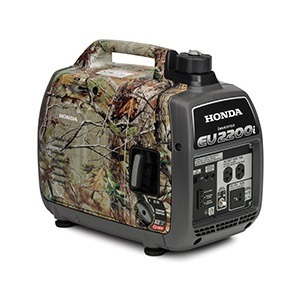 Honda EU2200i Portable generator features a runtime of 3.2 to 8.1 hours on only .95 gallon of fuel. It has a maximum output of 120 volts/2200 watts/18.3 Amps. The prominent Eco Throttle® feature improves fuel efficiency by reducing the speed according to the need. As it is not always running at full speed it lowers the sound of generator. It also has auto shut off option that stops the generator if it finds low fuel. It is also well admired for low noise. Everything in a relatively low price that the previous version Honda EU2000i. Honda EU2200i Camo has everything that is in Honda EU2200i. It has only one additional feature which is the Realtree APG wrap. It removes the traditional red color completely and gives a nice camouflage to the machine. It is tremendous for outdoor users, especially hunters. Apart from the features in Honda EU2200i, Honda EU2200i Companion has some technical enhancements. This model removed the traditional 12V DC outlet also as opposed to 20A 125V Duplex Outlet; it is furnished with a 30A locking plug. It also has a 20A 125V single outlet too. Dry Weight 45.6 lb. 46.5 lb. First of all you must understand EU2000i is no longer made by Honda. So getting a new machine is a rare case. Now if you come to the engine then EU2200i Uses far better engine than EU2000i. EU2200i uses a 121 cc heavy duty engine GXR120 while EU2000i uses Gx100. EU2200i ensures DC output of 12V, 100W (8.3A) Where EU2000i has a slightly lower performances 12V, 96W (8A). The New EU2200i has 10% more in every possible way than EU2000i. It provides extra 200 V than the previous version allowing the end user run a wide variety of electronics products. While it’s a concern of price EU2200i is slightly lower than the previous version with more capabilities. Unlike other generator, EU2200i has 2.31 square inch of ventilation area which keeps the machine cool even on the top speed. This will eventually safeguard the portable generator from unwanted damages. EU2200i is a pound heavier than the previous version. EU2000i was 46 pounds and this one is 47 pounds. Though both machine starts from noise level of 53 dB yet at top speed EU2200i is a bit louder than EU2000i. EU2000i makes 59 dB at top speed where EU2200i makes 62 dB at top speed. But the point is EU2200i is making 200W more than the EU2000 and 3 dB more noise for 200W more power is nothing. Honda EU2200i is a tremendous creation of Honda. 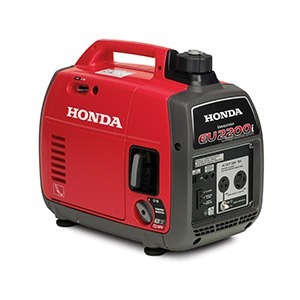 After long time Honda releases a new portable generator and its quality is non-negotiable. 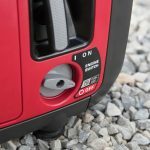 Honda’s reputation in portable generator industry is admirable and they proved it again by releasing EU2200i. There are numerous generators in the market but performance like this one is truly rare. No one can generate something closer to “line power” so efficiently and simultaneously like this one. Don’t forget the three years of residential and commercial warranty. Also the parallel connection is another awesome feature that can ensure robust power. As a top notch portable generator, Honda EU2200i is worth a try. Honda EU2200i is available in the market since spring 2018 and Honda has fixed the retrial price $1149.95. The price is already lower than the previous portable generator Honda EU2000i. You will get this generator both online and offline. But it is best to ensure that you are buying from the Honda’s authorized dealer without that you might face hassle in terms of warranty. There are some online store that might give you discount but most of them are Chinese website so don’t bother. If you are determined to buy Honda EU2200i from online then it’s better to look on Amazon. They also offer tremendous customer support and in terms of warranty there won’t be any hassle that’s for sure. Regarding price, most of the dealer would offer the specified price by Honda but some will also allow you a bit discount. As long as you are buying from an authorized dealer or from Camping World, I would be glad to get those discounts. This is my first generator so I can’t compare it with other models but we’re more than satisfied with it. Granted, it’s an investment compared with other models out there but you will have the Honda 2200 generator for many years to come. Unfortunately the power is out quite often here lately – we have no clue why, no one is telling us anything – so we’ve decided to buy a portable generator to power the fridge at least. The Honda eu200i stood out so right now I’m doing my own research, I want to make sure this is the best option right now. I think the EU2200i is perfect for you. I have a friend that lives in such an area and the power goes out every couple of days and he says he relies on his Honda. It’s powerful, durable, easy to maintain, you barely know it’s there (quiet). I’ve had the honda 2000 generator for a few months now and had no problems so far. We’ve used it quite a lot and I was amazed it was so quiet despite having 2000W. The 46 pounds make them easy to carry around and they’re not an eyesore either. WOW! So much power from such a small generator! 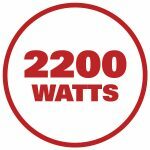 It’s impressive that with such small dimensions and with just 47 lbs, the Honda eu2200i can generate 2200 watts and is 10% more powerful than its legendary ancestor. Great time to be alive! My father has a Honda EU2000i for years and he swears it’s the best there is. Well, that was what he said up until he tested my new Honda EU2200i. He’s still sentimental about his generator but admitted this feels powerful as well. This model is on my to buy list. I still need to save around $250 for it so I’ll probably get it in the next 1-2 months. Or I may ask my wife for a loan :)) and get it quicker. I’m pretty excited to get it since I’ve saw it in action at a friend’s house. I don’t understand how this new model can be better and still cheaper? Is that possible? It sounds too good to be true to me. It’s smaller, cheaper, less noisy, has more power. How did they manage to make it on a smaller budget? Well, technology has evolved ever since the EU2000i was released and they probably found new ways to reduce costs while keeping quality standards high. I expect nothing less from Honda. I hope this model has a nice, long lifetime just like its predecessor. I didn’t know that they stopped making the good, old EU2000i. Boy, it’s the end of an era I guess. I loved that generator. Most of my family and friends have one. Really curios to see how the new model fares. Right now, on Amazon this has an impressive 5 star rating. I’m going to buy one shortly because my old generator died on me. I was looking at a EU2000i but this is better, so why not get this one instead? I personally like the lack of noise (mostly) from this. Compared to my previous generator, this purrs like a kitten and doesn’t keep us up all night. If you want a powerful portable generator, that doesn’t wake up the whole neighborhood, then this is it. EU2000i Great little generator, easy to transport,, very quiet. Two things that I think would be great for Honda to enhance on this generator would be to have built in level. Like this you know that the generator is level for proper operation also a plastic cover that would protect circuit breaker outlet and plugs to prevent water (rain) to get in there. When this generator working outside exposed to the elements of weather. It would be nice to keep the plugs, outlet circuit breaker dry. I sure these two improvements would be great to see and would be a very low cost to add on to the generator. Where are honda eu2200i generators made? My wife asked me this a few minutes ago and I was preparing to answer and realized I don’t know where. Some say Japan and others say the US. What’s the answer to this? Just saw a honda eu2200i vs eu2200ic comparison and things are pretty clear in my mind. I’m going for the Honda EU2200i for myself and I’m getting the IC for my father who has been driving me crazy talking about it. Question from a friend: what can the honda eu2200i run? My answer: What can’t it run? That pretty much sums up what the strong Honda EU2200i can do. It’s a beast if I ever saw one and I saw my share. 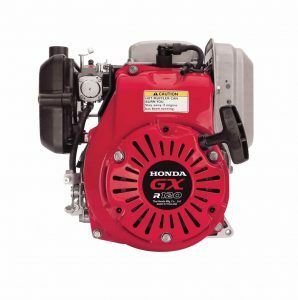 Will a honda eu2200i run a rv ac? I wonder. If I’d knew this for sure I’d probably buy one right away. I guess, in theory, it could do it but I’d like to test it. Anyone ever tested this? Does anyone know why retailers can’t sell this generator right now. We have tried for weeks at several retailers both online and in store and are told it can’t be sold right now by order of Honda. Is there a recall? We even tried buying from an independent sales person on eBay and they could not ship until told it was ok to by Honda. What gives? An internet search is turning up no news on why this is. We needed this generator before May, and see getting worried we won’t be able to get one before then. Yes, there is a Honda EU2200i Recall. In some EB2200i and EU2200i generators, the screws used to assemble the fuel valve may loosen during use allowing the valve to leak fuel. If gasoline or gasoline vapors leak, a fire or explosion could occur. A fuel leak caused by this issue typically is identified by a strong smell before, during, or after operation, or the presence of fuel underneath the generator.